Wood table legs are more easily repaired than metal table legs. Home improvement and hardware stores have all of the supplies necessary to repair your damaged wood table legs. 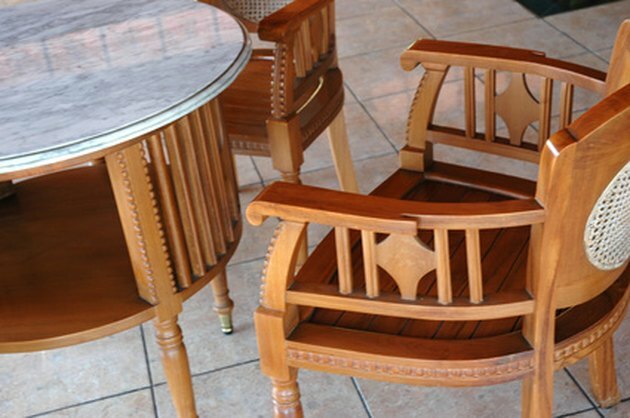 Most repairs can be made at home without the services of a professional furniture repair company. However, for costly and rare antiques, it is best to consult a professional restoration service before attempting to repair damage on your own. Most wood table legs can be repaired without professional assistance. Fill small or narrow cracks or splits with wood glue, and clamp the sides of the crack together with a tightly screwed C-clamp. Allow the glue to dry. For wider cracks or for cracks where slivers, splinters or chunks of wood are missing from the crack, proceed to Step 2. Use a putty knife to scoop a nickel-size clump of wood putty from the container. Use the flat edge of the putty knife to push the putty into the crack or split until it is filled. According to Baneclene, overfill the crack or damaged area slightly. Use a wet sponge to wipe the excess putty from the leg. Use your finger to smooth the putty until it's flush with the leg's surface. Allow the putty to dry. Wood putty dries in about 30 minutes. If the dried putty surface is wider than 1/4 inch, sand it smooth. Sand the scuff or scratch very lightly to smooth. Dip a cotton swab into wood stain that matches the shade of the wood table leg and paint the scuff or scratch with the swab. Allow the wood stain to dry. For deep scratches or scuffs, proceed to Step 3. Light a match and hold the end of a crayon (closely matching the shade of the wood table leg) over the flame until the colored wax of the crayon begins melting. Drip or press the melting wax into the scratch or scuff. Allow the wax to cool. Use the blunt end of a table knife to lightly scratch any excess or bumpy wax smooth and flush with the surface of the table leg. Turn the table over. Position the table leg where it should be when the table is in good repair. Trace around it with a pencil. Place the L-joint, one flat edge against the table leg, and the other flat edge against the underside of the tabletop. Use a pencil to mark inside the holes of the L-joint where you will need to screw the screws into the joint holes and into the wood leg and table. Screw one screw into the table leg through the top hole in the L-joint. Screw one screw into the underside of the tabletop through the end hole in the L-joint arm against the table's underside. L-joints have between two and six holes for attaching to wood or other objects. If your wood screws are stubborn going into the wood, tap the handle top with a hammer to help the screw bite the wood. Then, screw the wood screw into the leg and table. Turn the table right side up.